Bruxenomics: A US retreat from TPP: What does services trade tell us? During last weekend’s summit meeting of Asia-Pacific leaders in Peru, President Obama made the case that failure to sign on to TPP would “undermine our position across the region”. It would mean that if the US would not sign on the trade agreement, China would assert more leadership in the Asia-Pacific and opening a way to negotiate trade rules. Trade patterns between countries underpin the economic diplomacy behind any potential trade agreement. That too for the TPP. If we focus on one area in which most TPP members have an interest for future trade, namely services, that concern of changing trade leadership may be true. 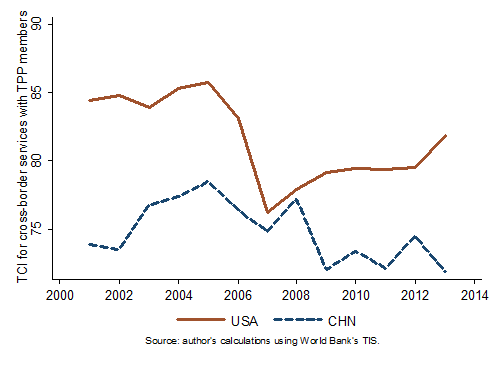 The picture below shows the so-called Trade Complementarity Index (TCI) for both the US and China with regards to all TPP members (excluding US). This index provides us with an idea how much the exports and imports of the US and China separately match with other TPP members’ needs, or are complementary. A high index means a good “fit” in terms of trade relations and indicates a great potential for a trade agreement between members. Note that this picture tells us the trade complementarity of cross-border trade in services or what others have called “digital deliverable services”, which are services that are traded over the Internet. Incidentally, TPP has the standard when it comes to the cross-border flow of data, a factor that reinforces trade in digital services. The pattern that arises is that initially the gap between the US’s and China’s trade match with other TPP partners in services trade narrowed. However, since 2008 it has widened pointing out that the US has found better trade complementarity with other TPP members. Around that time the US entered the trade talks. Whether the widening gap is really due to US involvement remains to be seen, but what clearly stands out is that at some point China was as much a good fit for trading services with these TPP partners as the US was. Yet, already before the US jumped in the negotiation talks, China’s services trade complementarity diminished in the region. This downward trend seems to be of a longer nature, which may be due to China’s regulations in the digital economy over these years. If that’s the case, it puts a serious question whether China can lead the region in terms of services trade, an item the Chinese government is eager to capitalize on. On the one hand, therefore, in a scenario that the US won’t ratify the trade pact, nothing tells us that this pattern could return. This would reinforce China’s role in the region regarding services trade that can be traded over the internet and indeed may therefore assert its influence to set the rules in this area. On the other hand, Chinese decline of the trade pattern in digital delivered services is no good recipe to underpin China’s potential future role in the region. If China was serious about fortifying these trade relations, it should start thinking about some of its digital regulatory policies that enable digital services trade.